Today, we discuss Andrew Davies 1995 adaptation of Pride and Prejudice and, specifically, Colin Firth’s portrayal of Fitzwilliam Darcy. I do not wish to debate who was “the best Darcy.” What I wish to discuss is how Davie created the image of Darcy. Firth once said, “What Darcy doesn’t say” is as important as what he does say. As viewers, we observe Darcy looking disapprovingly at all the Meryton residents. He puts distance between himself and others. We watch Firth observe Jennifer Ehle’s character, and we have no doubt that as Darcy, Elizabeth Bennet’s disregard for him piques his interest. In reality, Firth has few lines in the first half of the series; yet, he “speaks” to us. He must convey Darcy’s thoughts and attitude with a raise of an eyebrow or a tightening of a jaw line. Davies creates scenes and emotions (not expressed in the novel) to “flush out” Darcy’s character. In truth, Darcy is a MAJOR minor character. In the novel, he meets Elizabeth at Michaelmas (the end of September) and is at Netherfield until the ball (end of November). Darcy then does not see Elizabeth until Easter at Rosings Park. They are together a fortnight before the disastrous first proposal separates them once more, leaving the suspense to build to the fateful meeting at Pemberley during the first week of August. In other words, he has been in her company three months spread over a year before his second proposal. Yet, Davie was smart enough to know that the dominant female audience would want to see Darcy fall in love with Elizabeth Bennet. In the first half (up to the first proposal), Firth is invariably shown leaning against a mantle (usually with a mirror above) or staring out a window. Both stances are done in profile, indicating he is shutting himself off from new experiences and new people – it is his distancing technique. Even at the Meryton assembly, Firth is shot in profile when he meets the Bennet sisters for the first time. Also, at the party at Lucas Lodge, Darcy remains in profile by a mirror. (Notice that he is seen reflected in an opposite mirror. I love those types of shots for they tell the story so well!) At Netherfield, Darcy remains in profile at the window as the Bingley sisters discuss Elizabeth. We do not see Firth in full face until the scene about an “accomplished lady.” He stares at an unseen object/person, which we viewers assume is Elizabeth. This is a pivotal point in our definition of Darcy. He is watching Elizabeth, but we are watching him watch her. Immediately following this telling scene, Davies adds an unscripted Austen scene: Darcy is in his bath. When he steps to the window to observe Elizabeth with the dog, again we watch him observe her. Did you not develop an opinion of Darcy’s growing affections for Elizabeth without Davies telling you so in words? A simple visual effect told the story. From the bath scene onward, Darcy spends a great deal of time observing Elizabeth. This provides the viewer with characterization, but it was also a manipulative film technique to hook the obvious female audience. It was a glamorized framing of Firth as Darcy – offering him up to the feminine belief in true love. Even when Darcy returns to profile while he watches Elizabeth and Jane leave Netherfield, we know he observes her with growing interest. We automatically interpret his gaze. From Elizabeth’s departure from Netherfield and up to the first proposal, Darcy retreats to the profile, indicating he is fighting his attraction for Elizabeth. At the Netherfield ball, we first discover Darcy in profile before he turns to look upon Elizabeth. At the Hunsford parsonage, he sits in profile when he visits with her and the Collinses, along with Col. Fitzwilliam. In the first proposal, he is back standing before a mirror; he moves in profile after the rejection and then returns to the mirror. All of this staring out windows and standing before mirrors is the filmmaker’s way of telling the viewers that Darcy’s character has never looked at his true self nor at Elizabeth as a true choice for a partner. Davies displays Darcy’s sexual attractiveness, revealing the character as a sensitive man, as well as a physically fit one. Sensitivity is shown when he embraces a distraught Georgiana after her aborted elopement and with his distress when he discovers at Lambton Elizabeth’s grief over Lydia’s actions. Physically, this Darcy rides, hunts, fences, fishes, and swims. Although Darcy disappears from the novel for some time after the first proposal, Davies keeps the sexual tension by showing us Darcy fencing to fight his growing need for Elizabeth and then cooling his desires in the lake. Note that the fencing scene comes right before we first see Pemberley. It tell us who Darcy is, not what he owns. 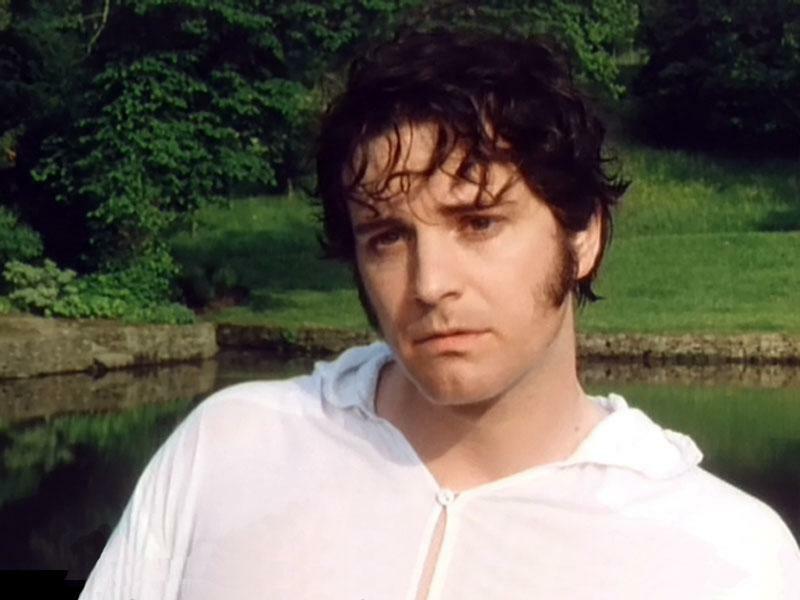 When Darcy writes Elizabeth the letter of explanation (the beginning of the second half of this series), his anger and mortification is conveyed to the viewers through a man in shirt sleeves, with disheveled hair, and a grim countenance. He labors over the writing. This second half of the series creates a “new” Darcy. Even the opening shot (his leaving the parsonage) shifts the focus from Elizabeth to Darcy. Davies’ adaptation follows Austen’s book faithfully in most respects, except with Darcy. Those visual images to which we are introduced emphasize Darcy’s emotional rollercoaster. We are teased with an image of Wickham’s debauchery followed by the section of the letter where we shift scenes from Darcy’s writing to Elizabeth’s reading, creating sexual attraction. Davies created an image of a determined Darcy, seeking Wickham and Lydia in London. Darcy is kept in our mind’s eye with images of this calculated search. Darcy buys information on the street from a penniless waif. He nearly forces his way into Mrs. Younge’s home. Later, we see Darcy standing up with Wickham at the church. Davies keeps Darcy’s character in the viewers’ minds even without Austen telling us these things. Note how Davies alternates between Elizabeth’s staring at Darcy’s portrait and Darcy’s dip in the lake. This alternation builds tension for their meeting. When Darcy returns to Longbourn, he reverts to that stiff, proud character. Again, he is seen in profile before he stares out the window. However, it is not just Darcy who reverts. Think how Elizabeth is once again embarrassed by her mother during Bingley’s proposal, during Lady Catherine’s visit, and with their first walk out together. Returning the characters to an earlier behavior builds suspense. So, what did you think? Did you learn something new today? Are there similar secrets you might share with the rest of us? I could go on and on, and we will discuss other facets of this adaptation later because it is one of the most successful ones. One thing you will find about me is that I love movie trivia!!! This entry was posted in film, Jane Austen and tagged film, Jane Austen, Pride and Prejudice. Bookmark the permalink. It may well be as you say Regina, produced for a female audience but I must admit that I have lost count of the number of times I have watched this production of P & P. Everything you say rings true, I must admit that there are times I get annoyed with Mr Darcy (I never think of him as Mr Firth) and wish somebody would give him a good swift kick in the pants to hurry him along a bit but I realize that if that happened the plot would be lost. To my mind the scene where Miss Elizabeth Bennet and Mr Darcy are walking after she tells him that her views are now quite the opposite is the most sensual scene I have ever witnessed on the big or small screen. I always find it electrifying; almost hoping in a way that he does a Rhett Butler grabs her close picks her up and carries her off. I find Miss Ehle to be an enchanting Elizabeth my only concern though is she is rather big, Elizabeth is I imagine rather petite and I would have much preferred to see Claire Foy play the part, whenever I see Miss Foy in a production I think Elizabeth Bennet, too I find Miss Ehle’s Elizabeths accent changed quite often, ( I must admit I do prefer her speaking as an Englishwoman she has a delightful cultured accent compliments of her English mother I believe), I like her pity we don’t see more of her. I agree, Brian. Olivier was never my idea of Fitzwilliam Darcy. Of course, the 1940 version of P&P was done in the manner of screwball comedies of the time. For Heaven’s Sake, they even used gowns from Gone with the Wind! I have never thought of Claire Foy as “Elizabeth,” but now that you mention it, I can see it. Foy was magnificent in Little Dorrit. I saw Jennifer Ehle at the Lincoln Center in the Tom Stoppard production of Coast of Utopia. She won a Tony Award for the production. It was odd to see her as a blonde. LOL!